Once the initial screen is done, more thorough measurements are carried out. Different compound concentrations are tested to study dose-response relationship and to measure IC50 and Ki values. 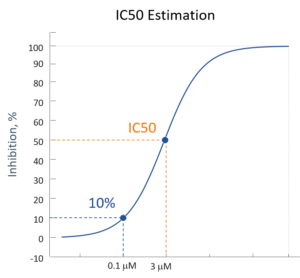 Mobility shift microfluidic technology is employed to perform dose-response studies and measure IC50 and Ki for one compound or whole libraries against multiple targets.